Connecting people with aphasia to others and to tools that can help them can be tough. At Lingraphica, we want to make these burdens a bit lighter for caregivers, support group leaders, and those with aphasia. 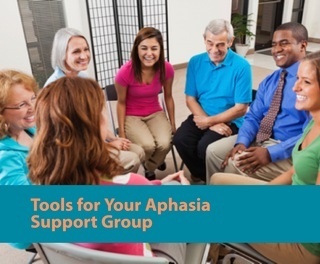 Check out our brand new webpage—Tools for Aphasia Support Groups—for some great resources to get you connected! Aphasia support groups can be a great way to get those with aphasia together with others who face similar challenges after a stroke or brain injury. But finding activities and topics that get everyone wanting to talk oftentimes is no small task. So Lingraphica put together a webpage of resources for those who lead and participate in aphasia support groups. Below is a preview of what you’ll find on that page. Lingraphica now provides a new service—at NO CHARGE—to any aphasia support group! One of our own clinicians will “visit” your support group through a live webinar to speak about our apps, therapy programs, and communication devices. She will also answer any questions you might have about our products or services. Looking for some general tips? Want to learn how to better communicate with a loved one who has aphasia? Or maybe you are looking for fresh ideas for your support group? We’ve got that! If you would like to connect with others who have aphasia, as well as their caregivers, family members, and professionals on social media, look no further than Lingraphica’s TalkPath News Facebook group! On this page, we use the TalkPath News app, an aphasia-friendly current events tool, to share and comment on top news stories, tips and facts about aphasia, hope and inspiration, concerns, ideas, jokes and few laughs. Click here to view our new page and to find out more about each of the sections detailed above!